Stay at Jacksonville's newest & finest resort! Located just minutes from the airport, Alltel Stadium & other attractions from Orlando to Savannah, you'll enjoy premium amenities & spacious accommodations at Pecan Park! Right under the glide path for the Jacksonville airport. Internet did not work. Noisy from the highway. Cable tv did work. I hope the planes don’t land on us. Need ear plugs and sleeping pills. Basically at the end of the international runway. Jets landing or taking off every 3 minutes and the fumes are not pleasant. Not worth the money by any means though I wouldn’t stay here again at half the price. Internet is nonexistent. This "resort" was like camping not in a campground but in an airport parking lot. The rows were laser-straight, quite orderly, and they were of reasonable size, though the concrete pads were cracked with the strain of the comings and goings of big rigs. But the air traffic from and to nearby Jacksonville International Airport was constant and loud. They have some of the requisite amenities of a "resort": swimming pool, playground, etc. And they've planted a few trees, which will need another 20 years to provide any shade. There is a nice sized pond, with the necessary Florida warnings about snakes and gators. The neighborhood is something to drive through without notice. It's that rough stretch of scrabbling old and new small shops that you find on the outer frontier of a city. Nonetheless, campers are there for the month or the season in their big, fancy RVs. I guess we all have different expectations. Stay away from this place! Sun Communities runs this place like a prison camp. Haven't had showers or bathrooms in over 10 months. Clubhouse is in disrepair & have to pay $150 to use it. Manager rides around in company truck to make sure nobody is talking to anyone and "plotting" to do something. If it were possible, I'd give it 0 stars. Been a camper for over 60 years and can truthfully say this is the worst campground I have ever been in and I've camped all over the country from Connecticut to California, Texas to South Dakota and Michigan to Virginia and Florida. We've stayed here in the past and loved it. Went there and found Sun Corp had bought it and raised the rates..and no bathrooms just porta potties. they ripped the baths apart 4 months ago. G S rates them a 10?? Someone needs to revisit the place.Everything Sun touches goes to hell fast!!! New owners in Nov. 2016 call this residence park a resort, it is not. Many long term residents 2+ years say the park has gone downhill with new owners. We were there for a week and reported our cable out Monday, when we left Sunday it had not been fixed or serviced. We also found sewer drains that had no caps. Long term resident sites were cluttered with multiple cars, storage buildings, etc. The lake is actually a settling pond and quite odiferous. The new owners are doing some renovations, primarily to the office. The bathrooms are also undergoing update so, they have been replaced by a portable restroom with three wet baths. All this for a park with 183 spaces. Current ratings are very overstated. Directly under the Jax runway. If you grew up around an airbase you will feel at home. While this could be a nice facility, its location makes it one of the least desirable with its position at the end of the regional flights fromJacksonville International Airport. If you are an aviation enthusiast, or hate to commute to the airport, this may be the place for you, but if camping at the end of the runway is problematic, don't stay here. We paid a premium price for our front row view of the airport, AND the facilities are under renovation with portable potties your only option. In addition, this appears to be a full-time park for quite a few folks, which as a traveler, is not always appealing. Stayed at Pecan Park RV Resort on our way back north from a stay in Southern Florida. The park is near the airport however we were not troubled by the planes. The park is undergoing renovations therefore I was not able to rate it higher at this time. The staff was extremely helpful. The park is located one exit from a wonderful shopping area which is very easy to get to. The park is very close to the interstate and access is very easy for a big rig. I recommend this park highly. There are no showers or bathrooms. The place is ripped apart. The portable toilet/showers are gross. The full timers are very messy. Some sites look very dumpy. One guy on the outside row plays loud music out of a trailer without regard for neighbors. Pool is nice. Office staff are nice. Manager is rude. Not a Good Sam Park of the usual caliber. If you are traveling through Jacksonville, FL and need a place to stop for overnight or a couple of days to see the area this is a great park. Very spacious and convenient for big rigs. All pull through sites are long and easy to access and the roads are all blacktop and easy to traverse. We were traveling with a 40' fifth wheel and had plenty of room. The WIFI works well and the grounds are very well maintained. The pool and laundry are nice and clean. There is a large Flea Market next door that is open on weekends and it is fun to walk around and see all the stuff. Because the park is close to the airport it is noisy during the day. If you are into aviation it is an excellent spot! When I booked this place I was skeptical of what we would find based on some reviews. I was pleasantly surprised. 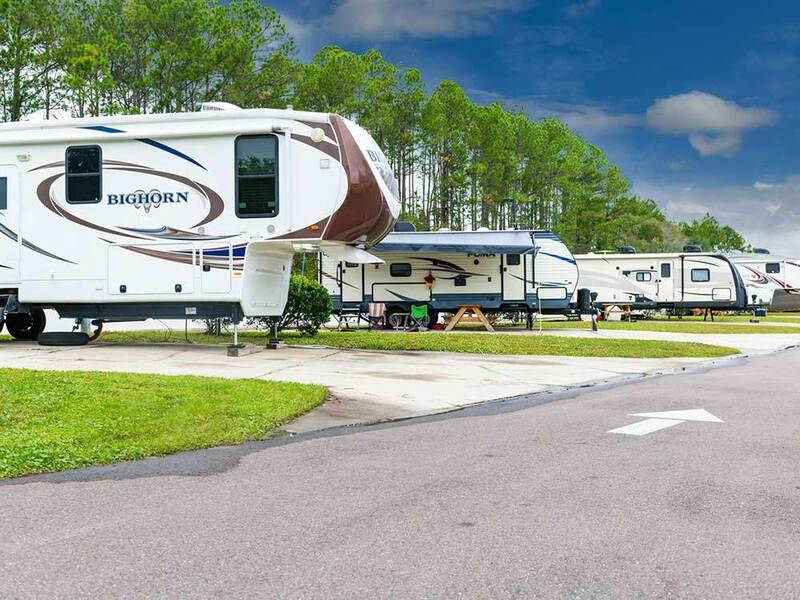 It is a very well maintained RV park. The sites are cement pads of two generous widths & lengths, each with a large grassy area between & a few bushes or a tree. Very good space between sites. Staff are friendly and helpful. The place was just bought out and they are transitioning. The pool is on the small side for a place this large & not currently heated. The only ding is there is no dog park but there is a lot of roadway for walking. Expect jet noise but for us it was more interesting and not bothersome. Quiet at night. 3 fighter jets took off one morning (of 7) in succession & returned in a tight formation several hours later. Though really loud, it was entertaining. Some people stay for extended time. The Flea Market, open on weekends & now a separate entity, is right next door. A nice tall white fence separates the two properties. Nice rigs in all spaces occupied. stayed six nights attending a sports event downtown. very clean, quiet and friendly rv park; nicely landscaped with grassy space between sites. level; good cable hookups; decent wifi; staff very helpful. planes were infrequent and not a distraction; large laundrymat. easy drive in to downtown. very pleased. Over the flight pad. It's a big rig paradise off of 95. Folks are helpful and friendly. Good paved roads. Very large paved sites. Wifi worked. Open. Good for an overnight. Plenty of room. Pecan Park is more like a city parking lot with hook ups than an RV park. It is right next to a major airport. Jet planes fly over, seemingly 100' above the camper, starting at 5:00 am. The first time it shook me out of a sound sleep, I was in a panic, I didn't know what was happening. There are no garbage cans. Campers are supposed to leave their trash on the curb for the staff to pick up, Very strange. I was Next door to several bunkhouse trailers, each one full of migrant workers. The hook ups worked fine. The staff was friendly. I'd rather stay in a Walmart parking lot, it is more quiet and secluded.